The start of the school year offers an ideal time to introduce students to project-based learning. By starting with engaging projects, you'll grab their interest while establishing a solid foundation of important skills, such as knowing how to conduct research, engage experts, and collaborate with peers. In honor of Edutopia's 20th anniversary, here are 20 project ideas to get learning off to a good start. 1. Flat Stanley Refresh: Flat Stanley literacy projects are perennial favorites for inspiring students to communicate and connect, often across great distances. Now Flat Stanley has his own apps for iPhone and iPad, along with new online resources. Project founder Dale Hubert is recently retired from the classroom, but he's still generating fresh ideas to bring learning alive in the "flatlands." 2. 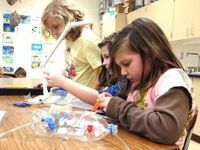 PBL is No Accident: In West Virginia, project-based learning has been adopted as a statewide strategy for improving teaching and learning. Teachers don't have to look far to find good project ideas. In this CNN story about the state's educational approach, read about a project that grew out of a fender-bender in a school parking lot. When students were asked to come up with a better design for the lot, they applied their understanding of geometry, civics, law, engineering, and public speaking. Find more good ideas in West Virginia's Teach21 project library. 3. Defy Gravity: Give your students a chance to investigate what happens near zero gravity by challenging them to design an experiment for NASA to conduct at its 2.2 second drop tower in Brookpark, Ohio. Separate NASA programs are offered for middle school and high school. Or, propose a project that may land you a seat on the ultimate roller coaster (aka: the "vomit comet"), NASA aircraft that produces periods of micro and hyper gravity ranging from 0 to 2 g's. Proposal deadline is Sept. 21, and flight week takes place in February 2012. 4. Connect Across Disciplines: When students design and build kinetic sculptures, they expand their understanding of art, history, engineering, language arts, and technology. Get some interdisciplinary project insights from the Edutopia video, Kinetic Conundrum. Click on the accompanying links for more tips about how you can do it, too. 5. Honor Home Languages: English language learners can feel pressured to master English fast, with class time spent correcting errors instead of using language in meaningful ways. Digital IS, a site published by the National Writing Project, shares plans for three projects that take time to honor students' home languages and cultures, engaging them in critical thinking, collaboration, and use of digital tools. Anne Herrington and Charlie Moran curate the project collection, "English Language Learners, Digital Tools, and Authentic Audiences." 6. Rethink Lunch: Make lunch into a learning opportunity with a project that gets students thinking more critically about their mid-day meal. Center for Ecoliteracy offers materials to help you start, including informative essays and downloadable planning guides. Get more ideas from this video about a middle-school nutrition project, "A Healthy School Lunch." 7. Take a Learning Expedition: Expeditionary Learning schools take students on authentic learning expeditions, often in neighborhoods close to home. Check out the gallery for project ideas. 8. Find a Pal: If PBL is new to you, consider joining an existing project. You'll benefit from a veteran colleague's insights, and your students will get a chance to collaborate with classmates from other communities or even other countries. Get connected at ePals, a global learning community for educators from more than 200 countries. 9. Get Minds Inquiring: What's under foot? What are things made of? Science projects that emphasize inquiry help students make sense of their world and build a solid foundation for future understanding. The Inquiry Project supports teachers in third to fifth grades as they guide students in hands-on investigations about matter. Students develop the habits of scientists as they make observations, offer predictions, and gather evidence. Companion videos show how scientists use the same methods to explore the world. Connect inquiry activities to longer-term projects, such as creating a classroom museum that showcases students' investigations. 10. Learn through Service: When cases of the West Nile virus were reported in their area, Minnesota students sprang into action with a project that focused on preventing the disease through public education. Their project (PDF) demonstrates what can happen when service-learning principles are built into PBL. Find more ideas for service-learning projects from the National Youth Leadership Council. 11. Locate Experts: When students are learning through authentic projects, they often need to connect with experts from the world outside the classroom. Find the knowledgeable experts you need for STEM projects through the National Lab Network. It's an online network where K-12 educators can locate experts from the fields of science, technology, engineering and mathematics. 12. Build Empathy: Projects that help students see the world from another person's perspective build empathy along with academic outcomes. The Edutopia video, "Give Me Shelter", shows what compassionate learning looks like in action. Click on the companion links for more suggestions about how you can do it, too. 13. Investigate Climate Science: Take students on an investigation of climate science by joining the newest collaborative project hosted by GLOBE, Global Learning and Observations to Benefit the Environment. The Student Climate Research Campaign includes three components: introductory activities to build a foundation of understanding, intensive observing periods when students around the world gather and report data, and research investigations that students design and conduct. Climate project kicks off Sept. 12. 14. Problem-Solvers Unite: Math fairs take mathematics out of the classroom and into the community, where everyone gets a chance to try their hand at problem solving. Galileo Educational Network explains how to host a math fair. In a nutshell, students set up displays of their math problems but not the solutions. Then they entice their parents and invited guests to work on solutions. Make the event even more engaging by inviting mathematicians to respond to students' problems. 15. Harvest Pennies: Can small things really add up to big results? It seems so, based on results of the Penny Harvest. Since the project started in New York in 1991, young philanthropists nationwide have raised and donated more than $8 million to charitable causes, all through penny drives. The project website explains how to organize students in philanthropy roundtables to study community issues and decide which causes they want to support. 16. Gather Stories: Instead of teaching history from textbooks, put students in the role of historian and help them make sense of the past. Learn more about how to plan oral history projects in the Edutopia story, "Living Legends." Teach students about the value of listening by having them gather stories for StoryCorps. 17. Angry Bird Physics: Here's a driving question to kickstart a science project: "What are the laws of physics in Angry Birds world?" Read how physics teachers like Frank Noschese and John Burk are using the web version of the popular mobile game in their classrooms. 18. Place-Based Projects: Make local heritage, landscapes, and culture the jumping-off point for compelling projects. That's the idea behind place-based education, which encourages students to look closely at their communities. Often, they wind up making significant contributions to their communities, as seen in the City of Stories project. 19. News They Can Use: Students don't have to wait until they're grown-ups to start publishing. Student newspapers, radio stations, and other journalism projects give them real-life experiences now. Award-winning journalism teacher Esther Wojcicki outlines the benefits this post on the New York Times Learning Network. Get more ideas about digital-age citizen journalism projects at MediaShift Idea Lab. 20. The Heroes They Know: To get acquainted with students at the start of the year and also introduce students to PBL processes, High Tech High teacher Diana Sanchez asked students to create a visual and textual representation of a hero in their own life. Their black-and-white exhibits were a source of pride to students, as Sanchez explains in her project reflection. Get more ideas from the project gallery at High Tech High, a network of 11 schools in San Diego County that emphasize PBL. To learn more, watch this Edutopia video interview with High Tech High founding principal Larry Rosenstock. Please tell us about the projects you are planning for this school year.